Meg Langslow is helping Mayor Randall Shiffley organize the Virginia Un-Fair, Caerphilly's entry in the race to replace the old, bankrupted state fair. Before a line can even form outside the ticket booth, however, a pair of Bantam Russian Orloff chickens are stolen from their coop in the chicken tent. Soon, a rash of vandalism crops up at the fair, showing no heritage farm animal, prize vegetable, or artisanal craft to be safe. As if patrolling the fairgrounds for the perp weren't enough, Meg runs into her cheesemonger friend Molly, who has another pressing matter: Her husband, Brett, has taken up with another woman and is now demanding half of their farm. But before Meg can find her the best divorce lawyer in the land, Brett turns up dead—and Molly becomes the prime suspect. When it comes to Meg's crime-solving in Caerphilly, nothing is ever elementary… in Donna Andrews' The Hen of the Baskervilles. I woke up to find three sheep staring pensively down at me. 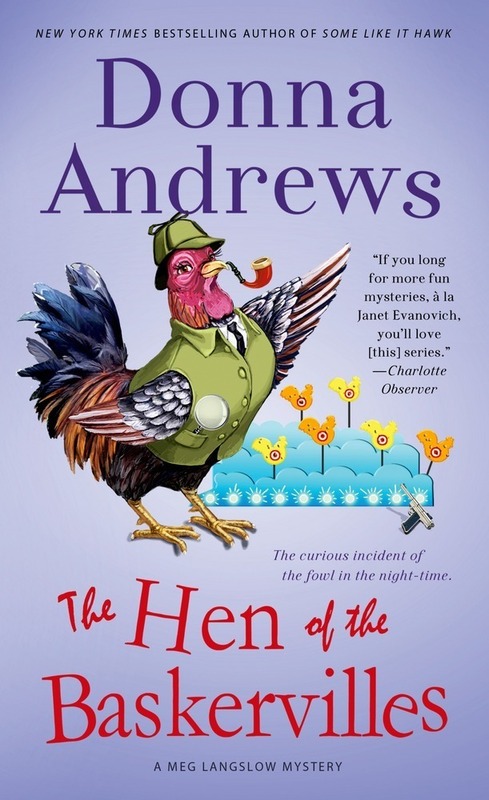 DONNA ANDREWS’s debut novel, Murder with Peacocks, introduced the Meg Langslow series and won the Agatha, Anthony, and Barry Awards for best first novel, as well as a Romantic Times Reviewers’ Choice Award for best first mystery. She has also received three Lefty Awards (Murder with Peacocks, We’ll Always Have Parrots, The Real Macaw) and two Toby Bromberg awards for funniest mystery (Crouching Buzzard, Leaping Loon; Swan For the Money). She spends her free time gardening at her home in Reston, Virginia.